Obama has created an exquisite problem by hiring so many senior executives from Google – some of the Oompa Loompas don’t seem to realise they no longer work for the company. Now a Congressman has called for an enquiry. The issue was made apparent when a trail of correspondence by administration official Andrew McLaughlin was exposed recently. McLaughlin is Obama’s deputy CTO – a freshly minted post, with CTO meaning either Citizens Twitter Overlord, or Chief Technology Officer – we believe it’s the latter. He was previously Google’s chief lobbyist, or ‘Head of Global Public Policy and Government Affairs’. McLaughlin’s contacts were also exposed. In an irony to savour, the exposure was by Google itself, as it introduced its privacy-busting Buzz feature in February. As our Cade pointed out, it would be hard to imagine a better Google story. A while ago I joked that perhaps the RIAA had secretly recruited Charlie Nesson to be its court opponent. Everyone from Ray Beckerman at the “Recording Industry vs The People” blog to Nesson’s old pals at the Berkman Centre at Harvard had advised him to knock it off – or at least not pursue a crackpot defence. But when it comes to the technology utopians, all jokes come true eventually. Nesson has achieved something I thought was completely impossible in 2009, and that’s to allow the US recording industry’s lobby group to paint itself in a sympathetic light. No longer must the RIAA explain why their biggest members are not using technology to make money for the people they represent. The Boston case allowed the four major labels to justify an enforcement policy against opponents who appeared compulsively dishonest, irrational, paranoid, and with an abnormal sense of entitlement. Nesson failed in his avowed mission “to put the record industry on trial”. He failed to show why disproportionate statutory damages are harmful, which could have had a lasting constitutional effect. He failed to paint the defendent as sympathetic, or “one of us”. He failed to demonstrate why copyright holders make lousy cops. He even had a Judge noted for her antipathy to the big record labels. In short, he ceded the moral high ground completely and utterly to the plaintiffs, the four major record labels. The labels’ five year campaign against end users is finally at a close, but Nesson’s performance leaves it looking (undeservedly) quite fragrant. The Creative Commons initiative fulfilled a major ambition last week – but it’s taken only days for the dream to turn to crap. 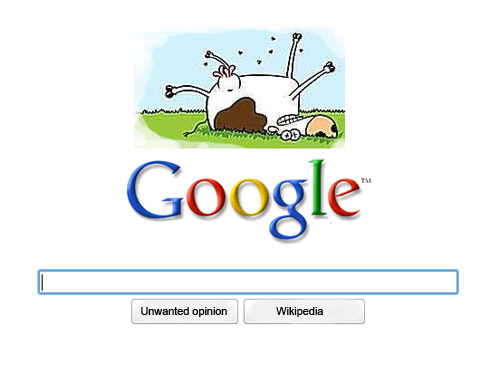 Google granted the wish by integrating the ability to search images based on rights licences into Google Image Search. Yahoo! Image Search has had a separate image search facility for years, but Google integrated the feature into its main index. The idea of making the licences machine-readable was a long-standing desire of the project, and lauded as a clever one. It was intended to automate the business of negotiating permissions for using material, so machine would instead negotiate with machine, in a kind of cybernetic utopia. Alas, it hasn’t quite worked out. As Daryl Lang at professional photography website PDN writes, the search engine is now choked with copyright images that have been incorrectly labelled with Creative Commons licences. These include world-famous images by photographers including Bert Stern and Steve McCurry. As a result, the search feature is all but useless. Since there’s no guarantee that the licence really allows you to use the photo as claimed, then the publisher (amateur or professional) must still perform the due diligence they had to anyway. So it’s safer (and quicker) not to use it at all. “The system relies on Internet users to properly identify the status of the images they publish, Unfortunately, many don’t… Many Flickr users still don’t understand the concept of a Creative Commons licence, or don’t care. Just as we predicted, in fact: the filtering is less than perfect, and it’s a lip-service to creators. Now, why did it have to fail? "A country bumpkin approach to slinging generalizations around"
WiReD magazine Editor-in-Chief Chris Anderson has copped to lifting chunks of material for his second book Free from Wikipedia and other sources without credit. But it could be about to get a lot worse. In addition to the Wikipedia cut’n’pastes, Anderson appears to have lifted passages from several other texts too. And in a quite surreal twist, we discover that the Long Tail author had left a hard drive backup wide open and unsecured for Google to index, then accused one of his accusers of “hacking”. Does the WiReD editor and New Economy guru need basic lessons in how to use a computer? Waldo Jaquith of Virginia Quarterly Review unearthed a dozen suspect passages after what he called “a cursory investigation”, and posted his findings here on Tuesday. Wikipedia entries for ‘There Ain’t No Such Thing as a Free Lunch’, ‘Learning Curve’ and ‘Usury’ had been pasted into Anderson’s book. In addition to Wikipedia citations, which Anderson reproduced with the errors intact (oops), Jacquith suggests he also lifted from an essay and a recent book. Presented with the evidence, Anderson blamed haste and (curiously) not being able to decide on a presentation format for citations, for his decision to omit the citations altogether. Other examples were “writethroughs”, he said. Champion’s examples of churnalism include blog posts, a corporate websites and (again) Wikipedia.